I saw this today as I was leaving the Labrynthine Bowels of a Condo Complex. One of my goals in life is to write signs like this. I decided to write a few of my own, just to try out my Mad Sign Writing Skills. This area is under camera surveillance. We are only filming you in case you do something funny. We mean youtube funny. We have installed security cameras on premises. 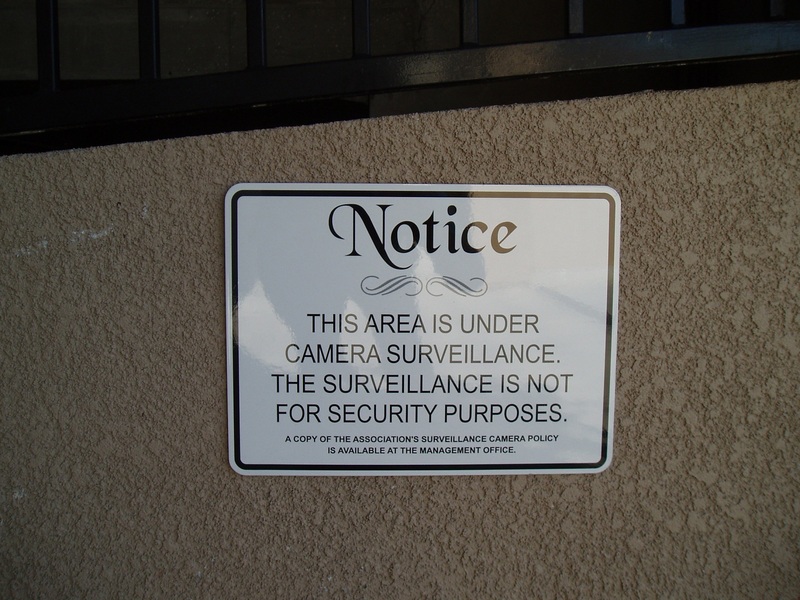 Okay, maybe “Security Cameras” is a misnomer. How about “Useless Boxes with Lenses”? These aren’t even cameras. We spray painted a shoebox black and glued a silver bottlecap on the end of it. We want you to feel at home, so we installed cameras that will look away while you’re being assaulted, just like your neighbors. Yeah, we don’t even really have any cameras or anything. Have a nice day. Is it too early into this blog to say we’re all going to hell? Okay, I’m just kidding. Mankind is totally headed in the right direction. Am I the only one creeped out by mannequins? This entry was posted in Pretty funny and tagged creepy, funny, hell, humor, retail, security, shopping, well-endowed mannequins. Bookmark the permalink. The answer to your last question is no. Yes! I saw that one. I loved Twighlight Zone. Maybe you could write a screenplay that has Twilight becoming Twightlight Zone, and Edward and um Krirsten Stewart could be frozen and then pushed off the 13th floor. Let’s make it the 90th. Sure, a lot of mannequins are creepy, but so are a lot of people. You just need to find one you can be comfortable with, if you know what I mean. I myself have a rather intense relationship with a discarded Macy’s mannequin that has stumps for arms. Thanks Joe. I actually found some pretty awesome mannequins when searching “well-endowed mannequins”. I’m getting ready to ask my wife if we can have a menage a mannequin. Yeah, I guess everything looks better on a size minus zero mannequins. Reminds me to start ’bout Halloween costumes….uh, BLOG IDEA. I can’t believe no one here brought up the 1987 movie Mannequin (Kim Cattrall, Andrew McCarthy). A disturbing horror flick that was marketed as a rom-com. You’ll be pleased to know there is a sequel available on DVD. We regret to inform you that we have installed security cameras on the premises that you will see here before you. We offer our sincerest apologies for the inconvenience of having to read this sign about something that will have virtually no effect on your safety and/or happiness in life. Thank you. Great sign! I’ve got to get over to London. I heard they have more security cameras than (really funny metaphor for a lot of stuff).